The M30 Alarm Speech Dialler is an industrially designed unit designed for harsh critical environments. It comes in 4, 8, 16 & 56 input/channel versions all with the same standard features, including. Integrated Battery Backup with 24+ hour’s protection. Each input / channel has its own individual message allowing you to easily identify and differentiae between the separate inputs. For example instead of the M30 reporting “Channel 12” you can record a message saying “Power Failure Block 2”. 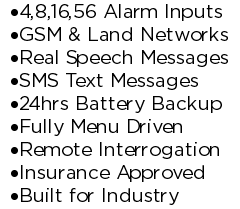 All the speech messages are fully user configurable and designed to be recorded by the end user. Recording and updating speech messages is very simple and is done via the keypad and LCD display, with the M30 offering you hints and tips along the way. To record / update a speech message plug a standard phone handset into the M30, then via the menu and LCD display select the message you want to change and follow the instructions given. If you would like an alternative to receiving Alarm Speech Messages we now offer an optional upgrade module that allows you to send SMS Text Messages to your mobile phone instead of or as well as speech messages. For more information or to get the current price list please Contact Us or check out the Alarm Dialler Standard Features & Alarm Dialler Optional Features Page.